By using our simple steps we can show you how easy it really is to remove crab meat from your cooked crab, avoiding any waste. 1. Begin by breaking off the crab claws and the crab legs, making sure that you break the knuckle joints too. Put these to one side for the time being. 2. Next place the crab on a board, back-shell down and start by breaking off the tail flap with your hands. Then continue by pushing the blade of a knife between the body and the back shell and twist the blade to release the back shell. Continue by placing your thumbs on either side of the body and press firmly upwards until the body comes away. 3. Then pull the feathery looking gills off the body and throw them away. 4. Take a spoon and begin by scooping the brown meat from the centre of the body section and keep it separate from the white meat. 5. Next cut the body section in half using a sharp knife and remove all the white crab meat from the little channels using a crab pick. Having removed all the crab meat, you will be left with a hollow light piece of shell. 6. Now take the crab claws and using a sharp knife crack the shell and remove all of the crab meat from the claws using a crab pick. Make sure that any thin pieces of bone concealed within the meat are removed. Continue by removing the white crab meat from the crab legs using the same process. 7. Place the back shell of the crab on a board with the eyes facing upwards and press on the small piece of shell located behind the eyes until it snaps. This will allow you to then lift out and throw away the mouth piece and stomach sac. 8. Finally, scoop out the brown meat from the back shell using a spoon. This can sometimes be quite wet and solid. Again, this should be kept separate to the white meat. Brown crab meat can have quite a strong and intense flavour. We recommend adding it to a crab salad as a quenelle or adding a small amount to a crab linguine which will give the dish a lovely seasoning. 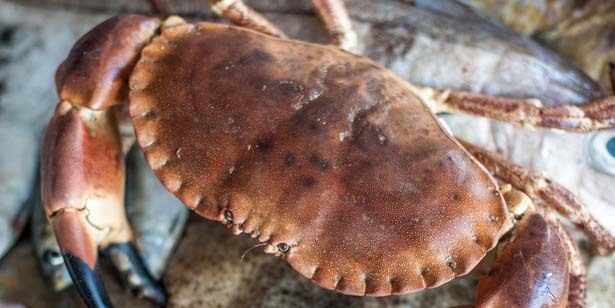 Make sure that you remove any fiberous remains from the brown crab meat before eating it. This can be done by taking a handful of brown crab meat and squeezing it in your hand. Anything left in your hand is likely to be fiberous remains so will need to be thrown away. The crab meat can then be passed through a siv, to make sure that any further fiberous remains are removed before eating. If you would like to learn more cooking tips watch Jack Stein’s video on how to cook mussels here.